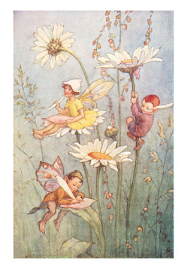 Four little fairies brought their new friend through a crack in the garden. She flew up high. She flew up the long blue poles and over the safety net. The other fairies followed her, and soon they were all bouncing on the trampoline. They did tiny little fairy bounces. They jumped together and sang fairy songs. The fairy in blue flew up onto the leaf of the nearby bush. Folding herself up tight, she slid down the leaf, into the air, and down onto the trampoline. She laughed, and the other fairies laughed, too. Soon, they were all trying it. It was fun to fly through the air and not use their wings. At last they were tired and flew into the camellia bush to have a rest. “We'll call her Goldie,” said the fairy in gold, whose own name was Amber. 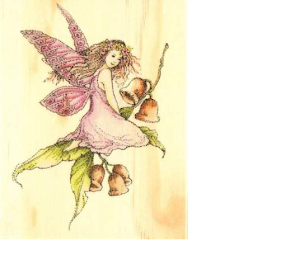 “Couldn't we just ask her what her name is?” asked the fairy with the dusty moth wings. Her name was Daisy. “Is it Happy?” asked Amber. “Is it Sharona?” asked Zaira. “Is it Martha and the Aeronauts?” asked Daisy. “No, no, no, no,” answered the New Year Fairy.